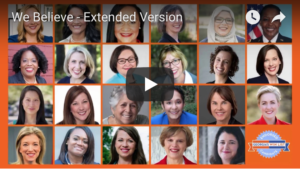 Georgia’s WIN List’s record-setting slate of 36 endorsed women. And Georgia’s future! 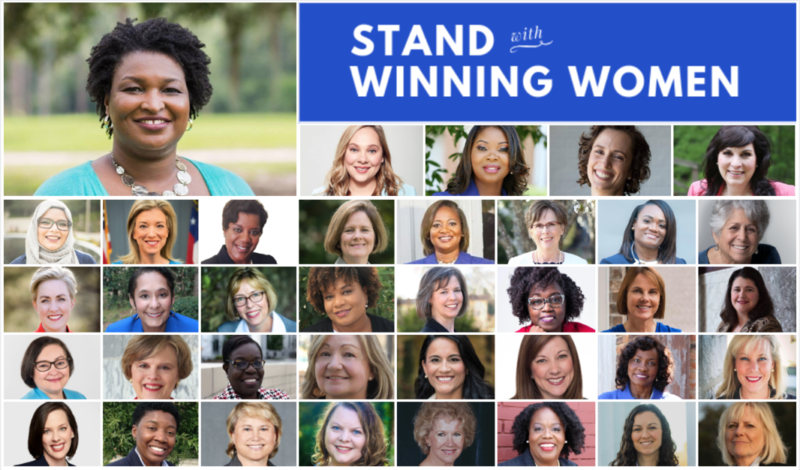 “Stand With WINning Women” event celebrates WIN List’s record-setting slate of 36 endorsed women, the Year of Women in Georgia, and the 18 years of success. 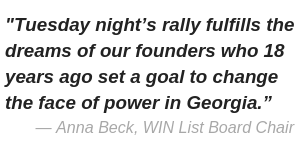 ATLANTA, GEORGIA, UNITED STATES, September 24, 2018 – Georgia’s WIN List, the state’s leading political action committee dedicated to electing Democratic women, celebrates a record-setting 36 endorsed candidates during a campaign rally on September 25. With Stacey Abrams and Sarah Riggs Amico at the top of the Democratic ticket, Georgia’s WIN List endorses a one-two punch to the GOP patriarchy. The “Stand With WINning Women” rally is scheduled for Tuesday evening September 25th at The Georgia Freight Depot. 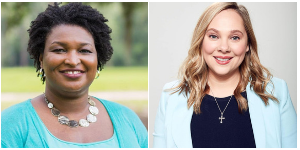 The event celebrates the historic “first” of women nominees at the top of Georgia’s ticket: Stacey Abrams for Governor and Sarah Riggs Amico for Lt. Governor; as well as a record-setting number of diverse women seeking legislative seats long held by Republicans. During the rally, several of the endorsed candidates will address hundreds of avid supporters. Candidate tables staffed by campaign volunteers will recruit volunteers to make calls, write postcards, or knock on doors and offer literature or yard signs. Checks will be presented to all of the endorsed women during the event. WIN has helped elect more than 60 women over the years, 33 of whom currently serve. Among those currently serving are the state’s first LGBTQ representatives, the first two Latina representatives, and the first Vietnamese-American representative. Additionally, Georgia leads the nation for the number of African-American women in its legislature. WIN List’s Executive Director and Founding Chair Melita Easters reports Georgia is tied with Maine for the most Democratic women candidates – 91 – on any November ballot nationwide. Further, Georgia joins Indiana as the only two states nationwide with Democratic women as nominees for both of the top two governing positions. The third state is Hawaii, where the nominees are both Republican women. EMILY’s List, the nation’s leading PAC for women, has also endorsed 26 of the Georgia’s WIN List candidates – the most ever endorsed in Georgia. With three additional WIN List endorsed women seeking statewide constitutional offices – Janice Laws for Insurance Commissioner and Lindy Miller and Dawn Randolph for Public Service Commission seats – Georgia is in the top tier of states for the number of women on the statewide ballot. At Georgia’s WIN List, WE BELIEVE Stacey Abrams can shatter Georgia’s glass ceiling. WE BELIEVE women will WIN big in November. Watch and see!